It is always good to have your ego boosted by wonderful compliments. From when I started blogging, I looked at myself as offering great recipes that work. I have never looked at myself as taking good photographs. Because of this, I have not bothered to save any of my photos in a high resolution format. Once they have been uploaded to my blog I delete them. I could see no reason to keep them on my hard drive. But that has all changed. In January I was approached by an International Publisher asking if I would contribute a recipe to a magazine they are publishing in a series of magazines, this one specifically using sugar free recipes. They wanted one of my existing recipes but as I could not send them a high res photo, they could not use it. I offered to send them a recipe that was not yet published on my blog, and one that I had a high res photo of. And the recipe I sent them was this one for apricot ice cream. And the reply email was about how great the image was! This compliment was followed by one on my blog from a professional food photographer whom I rate very highly, given his work and reputation in the industry. This recipe for apricot ice cream came about when I had a punnet of very over ripe apricots that needed using up. As it was the height of summer and we had visitors, it seemed like a great refreshing ice cream to make, and it is. The apricot flavour is quite distinct and I am sure you can use any stone fruit to make this recipe. Wow Tandy…congratulations! And yes, this apricot ice cream looks super refreshing…indeed awesome picture! Was doing some research this morning looking for recipes using apricots, I am going in a cooking comp later this month and that is one of the ingredients. 🙂 Came across your post, yep, defo using it. Thanks for sharing this delightful recipe, and congrats on being asked to share in a publication. Very exciting. I’m not really a fan of ice cream (I know, I know) but a fresh fruit version especially apricot does sound appealing. WOW, that is awesome Tandy!! Congratulations. 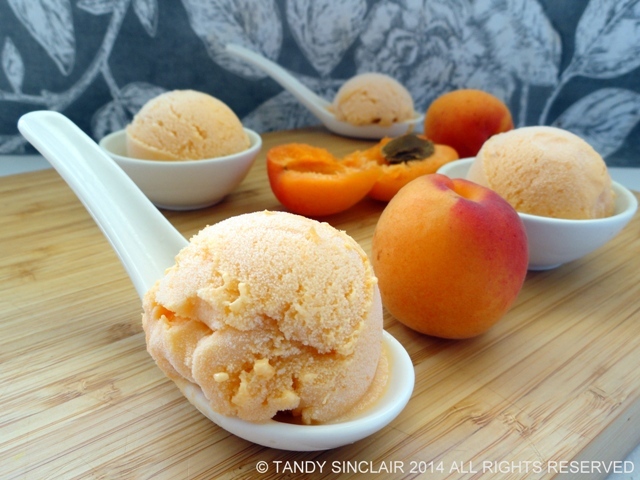 I love love apricots and am thinking I need to try this ice cream ASAP! Congratulations Tandy! I see why as this photo of your icecream is making me crave apricot icecream and I have never ever had that flavor before. I can wait for stone fruits to be in season. Congratulations!! That is a super pretty photo and makes me want to inhale that ice cream! Yum! Looks delicious! How did you get your ice cream to stay frozen whilst taking photos? Gorgeous photo, Tandy, gorgeous recipe too! I can just imagine the ripe summery apricots in the ice cream. Delicious. But I find the recipe even more enticing, I adore apricots so this is perfect! that is a brilliant photo. And well done to you! It is a great pic indeed, Tandy! Can’t wait to get my hands on some stone fruit!! Congrats on your article Tandy, this ice cream looks amazing, love the addition of cardamom. My mom would love this ice cream, she is a big apricot fan. Your photos are always lovely. Have a super day Tandy. It is inded a lovely recipe and a lovely shot! And are you talking about our lovely Roger? I always get a bit giggly and happy when he compliments a shot 🙂 He’s an amazing photographer.